LO, HOW A ROSE EER BLOOMING. Lo, how a Rose eer blooming from tender stem hath sprung, of Jesses lineage coming as saints of old have sung. 2 Lo, how a Rose eer blooming from tender stem hath sprung, of Jesses lineage coming as saints of old have sung. 3 It came, a floweret bright, amid the cold of winter, when half-spent was the night. 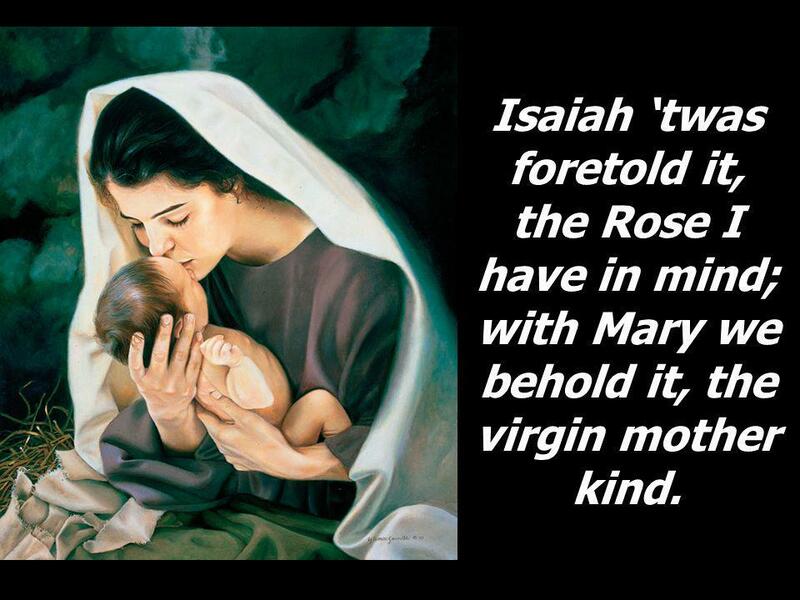 4 Isaiah twas foretold it, the Rose I have in mind; with Mary we behold it, the virgin mother kind. 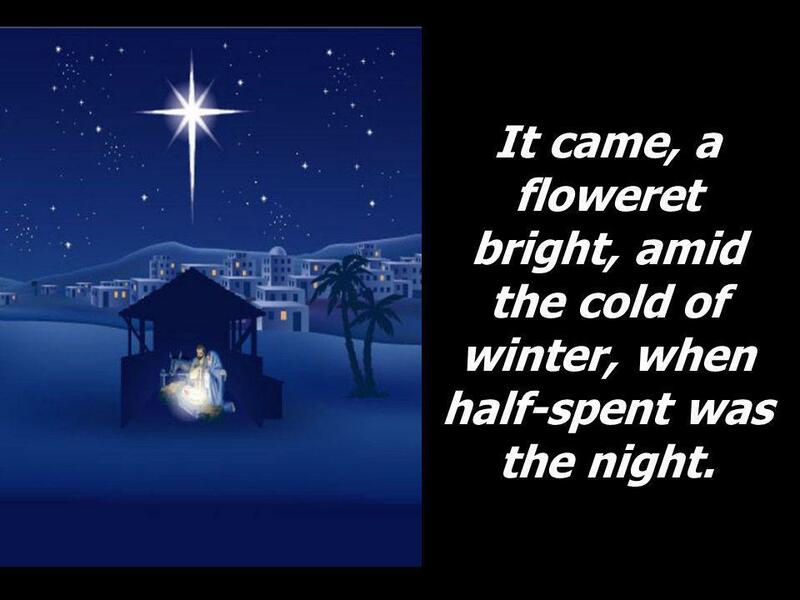 5 To show Gods love aright she bore to us a Savior, when half- spent was the night. 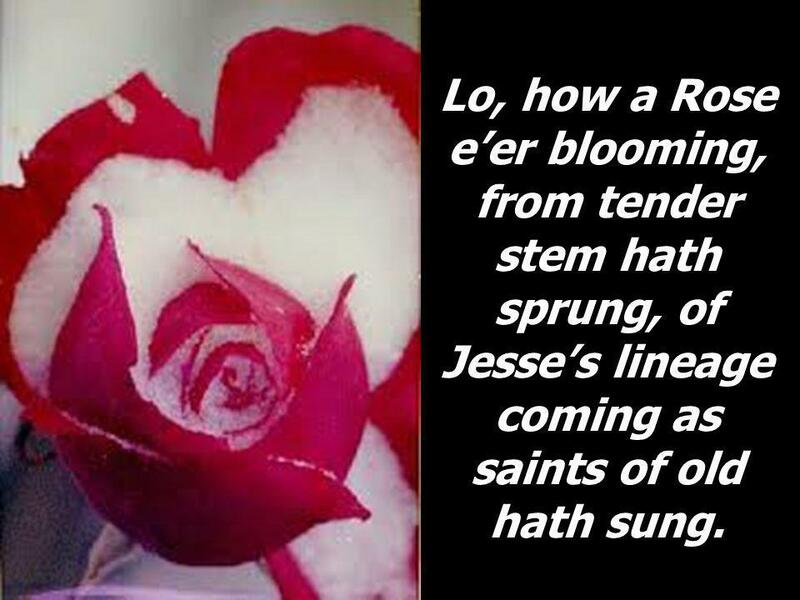 6 Lo, how a Rose eer blooming, from tender stem hath sprung, of Jesses lineage coming as saints of old hath sung. 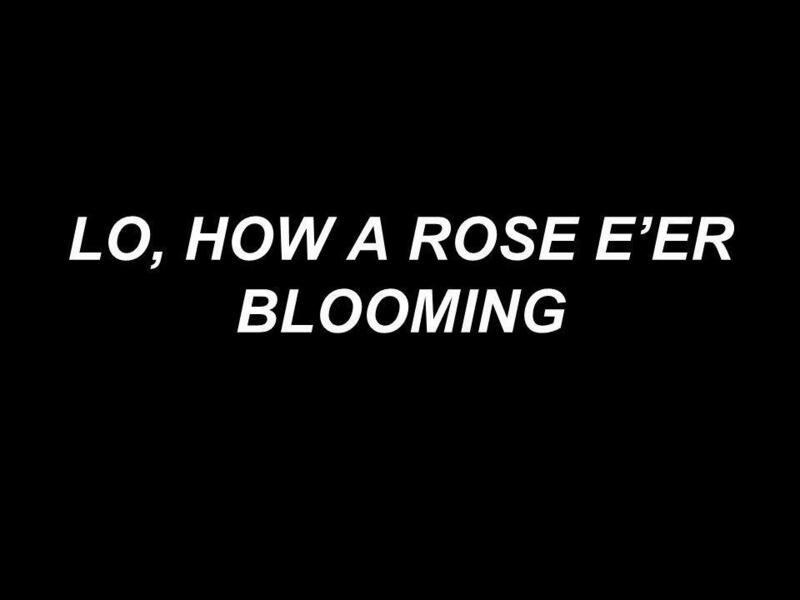 8 Lo, how a Rose eer blooming. 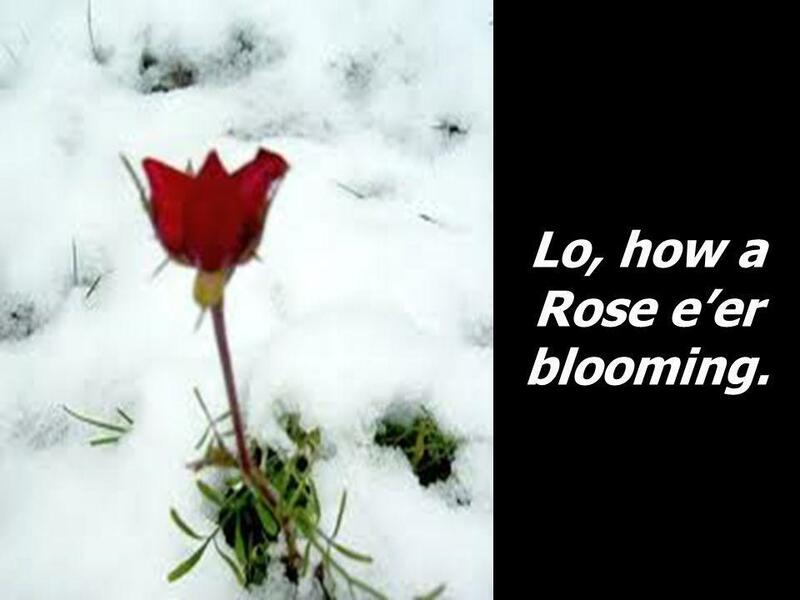 Download ppt "LO, HOW A ROSE EER BLOOMING. Lo, how a Rose eer blooming from tender stem hath sprung, of Jesses lineage coming as saints of old have sung." LO, HOW A ROSE EER BLOOMING. Lo, how a Rose eer blooming from tender stem hath sprung! Of Jesses lineage coming, as those of old have sung. We’ve a Story to Tell Words and Music by H. Ernest Nichol Words and Music public domain 356. 1. 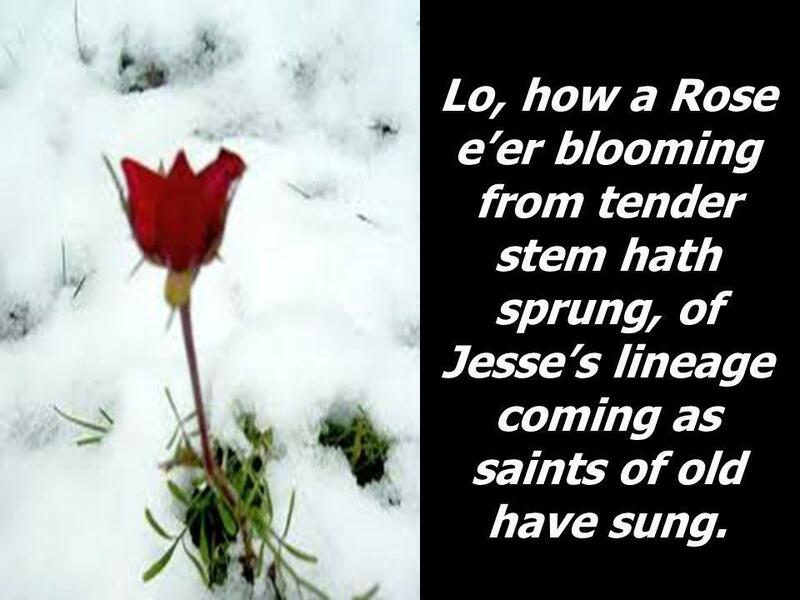 Low, how a Rose e'er blooming From tender stem hath sprung, Of Jesse's lineage coming As saints of old have sung. It came, a flowret bright, Amid the. Are You Ready to be Chosen by God? Luke 1: In order to be ready, you need to become pure (vs. 27) Luke 1:26-27 In the sixth month the angel Gabriel. “And she will bring forth a Son, and you shall call His name JESUS, for He will save His people from their sins.” Matt. 1:21. Silent Night Joseph Mohr Silent night, holy night! 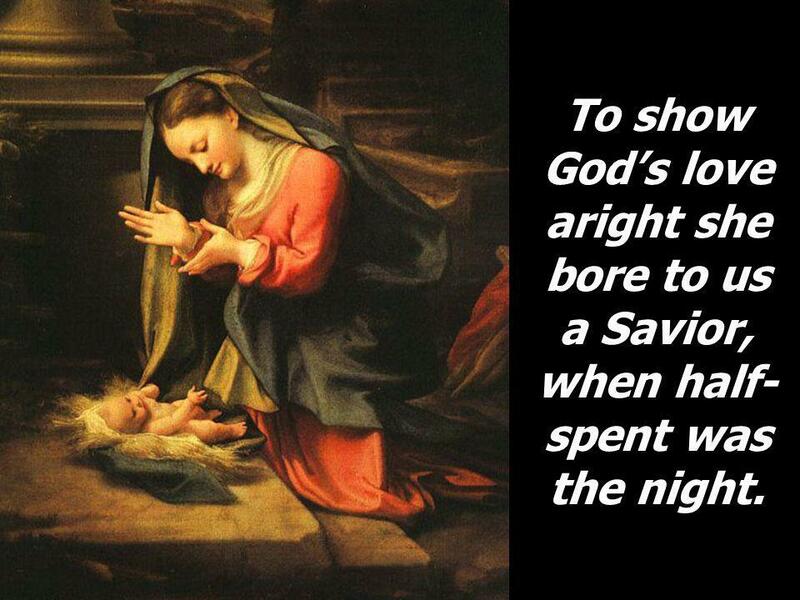 All is calm, All is bright, Round yon Virgin, Mother and Child Verse 1. Draw Near Unto Me “Draw near unto me and I will draw near unto you.” D & C 88:63. Prophecies Concerning Christmas Born of the seed of the woman Genesis 3:15 I will put enmity between you and the woman, and between you offspring and her. Praise Service “Christmas Eve Service” December 24, 2008. “Awaiting Christ’s Arrival Through Isaac” November 30, 2014. This Is How We Know 1 John 3:16 By Jamie Owens Collins.